David Rowe could not find a job. Like a lot of people I know, he had a brand new degree, a big pile of debts, and absolutely no way to get a foot in the door thanks to the economic downturn that has affected both rich and poor alike. However, rather than succumbing to depression, the University of Kent graduate got creative. 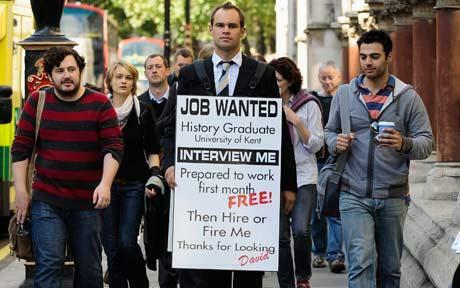 Needing to differentiate himself from the hundreds of thousands of newly-minted college graduates, he strapped on a sandwich board, offered to work for free for the first month, and walked up and down London’s Fleet Street. The good news for David is that his idea worked. He caught the eye of Parkhouse Bell recruiter Gavin Walker and now has employment. He didn’t even have to work the first month for free! Who would have known that wearing a sandwich board, one of the oldest advertising tricks in the book, would actually still work in today’s Internet age? Finding a job is all about your ability to sell yourself, and the easiest way to do that is to get out of the house and get in peoples’ faces. If you have the resume to back it up, maybe you can beat the odds, too. When the going gets tough, the tough get creative.